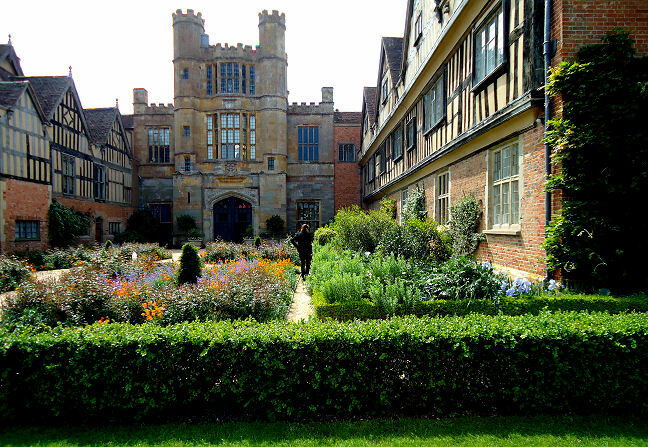 Kings Coughton, Near Alcester, Warwickshire, B49 5JA. This is one of those properties which can only happen in England. 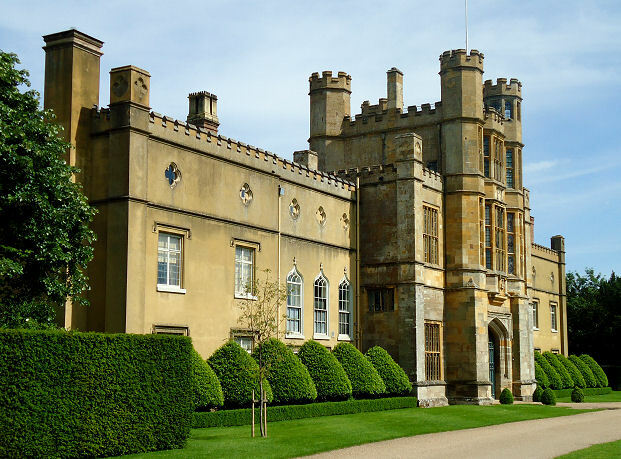 Owned by the Throckmorton Family since 1409 and still managed by them in spite of the fact thatthe overall running and costs have been born by the National Trust for some years. If this were France or Germany then the property would have fallen into the hands of the State and lost much of its magic becoming a museum rather than a family home. It is of great historical importance as the main conspirators in the Gunpowder Plot of 1605 planned their deeds here and some escaped back here after the capture of Guy Fawkes. There is a very interesting exhibition, outlining the major events and the relationship with the Throckmorton Family, in the grounds. 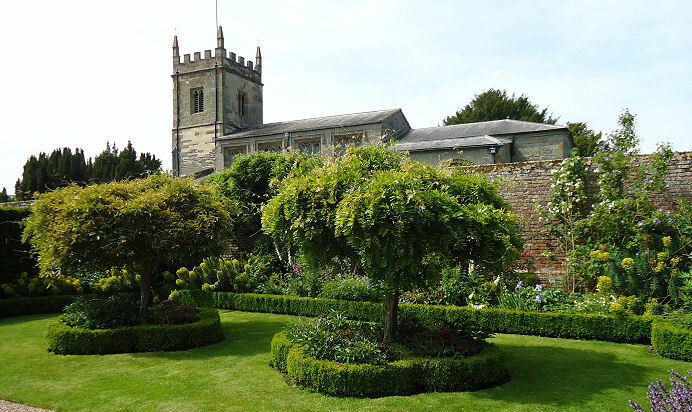 The gardens are being developed, or should I say redeveloped all the time and the Lady of the house has added several gardens over the years as well as planting the immediate front and rear with yew specimens to give a feeling of Tudor splendour and wealth. The Elizabethan style knot garden in the Courtyard was opened in 1992 and in 2003 the Mary Copse memorial garden was completed as a lasting testimony to the hard work of one of the Trust’s most loyal workers. Be careful when you drive into Coughton as it is approached from a busy main road. There is a separate entrance for cars and coaches and a one way system so you come out via the lane to the side. Inside there is a series of out buildings including the usual gift shop and plant sales and a splendid cafe/restaurant. The National Trust are making their properties more welcoming to the casual visitor and I suspect as many people now come to eat and wander around the gardens as visit the house. There is even a play area now for the children. 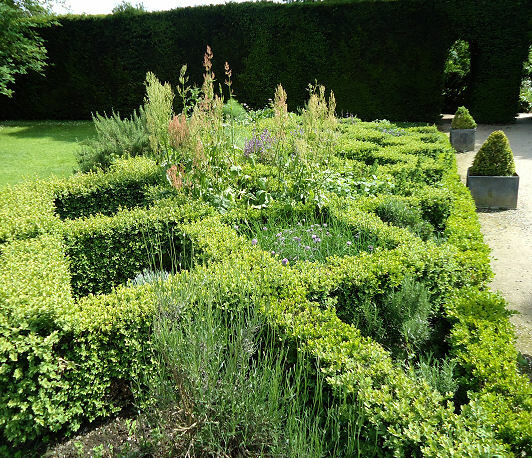 The gardens themselves are approached via an arch cut into a massive yew hedge which gives a sense of adventure as to what you might find once beyond. 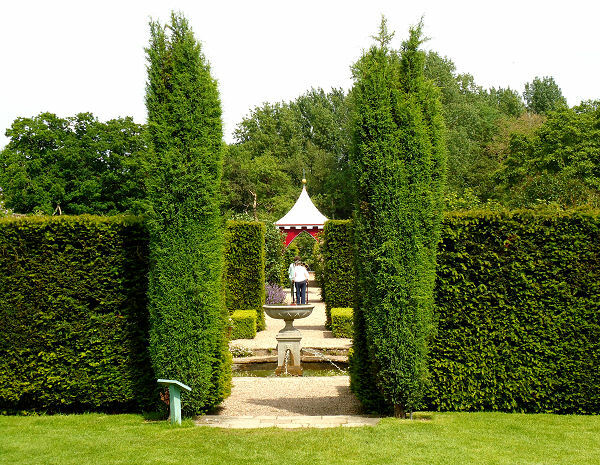 Inside is a large lawned area with separate stately yew hedges standing on their own with urns on plinths to give a sense of grandeur. Turn the other way and you see the house with its box parterres in the courtyard. This is where visitors enter the house. 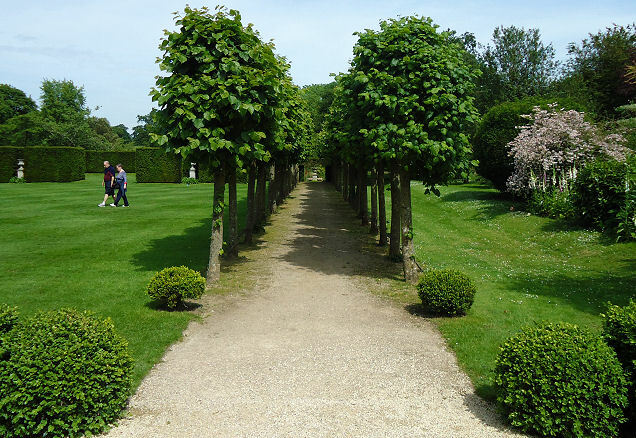 To the right of the yew sentinels is an avenue of lime trees all cut to the same shape which draw the eye down to the end of the garden where you will find a secret sunken garden and if you walk a bit further you come across a large pool. Strictly speaking the trees aren’t pleached as their branches don’t go in one direction and the foliage doesn’t intermingle from tree to tree but give it a few years and it undoubtedly will. Now having seen all this you might be forgiven for thinking this is all but there is another major area to explore. Follow the path to the end of the house and you will see a sign pointing right to the churches. (There are two, one Catholic and one Protestant). Signed to the left is a walled garden with its entrance quite small but with a kiosk making it obvious where to go. There are several rooms in the walled garden. A rose garden overbrimming with all sorts of other planting. 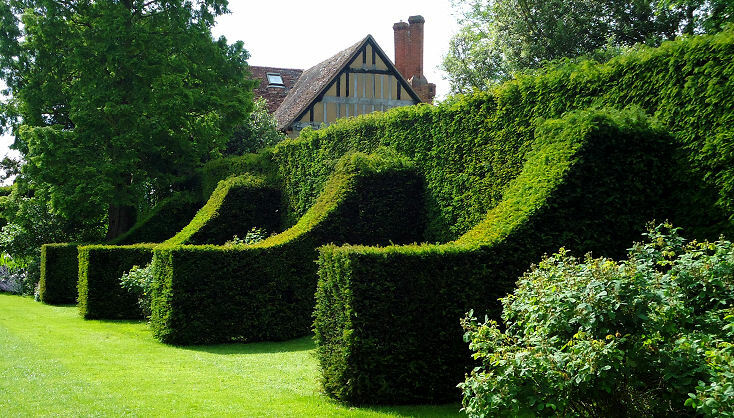 You then move into a more formal part with “rooms” divided by yew hedging in the good old Hidcote tradition. There you will find a splendid pond garden with low box hedging, standard clipped specimens and interesting sculpture. 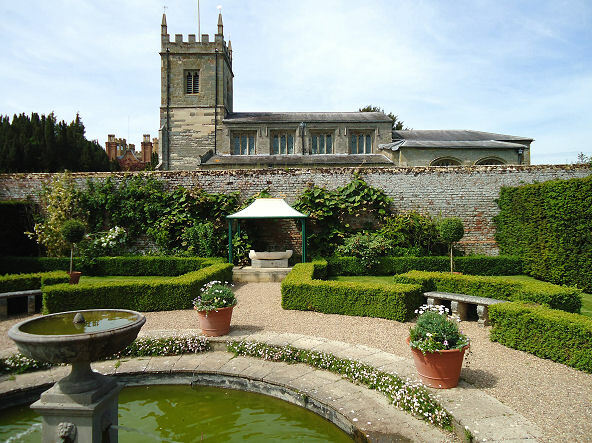 Although you have a sense of being enclosed from the elements in the walled garden there are places where you can glimpse interesting links with history, like seeing the church from the pond garden. This all adds to the sense of drama. One interesting thing to look out for in the walled garden especially for the topiarist are the wisteria umbrellas. These are trained up a sturdy metal pole and then trained back down over its spokes so that the flowers can hang downwards. 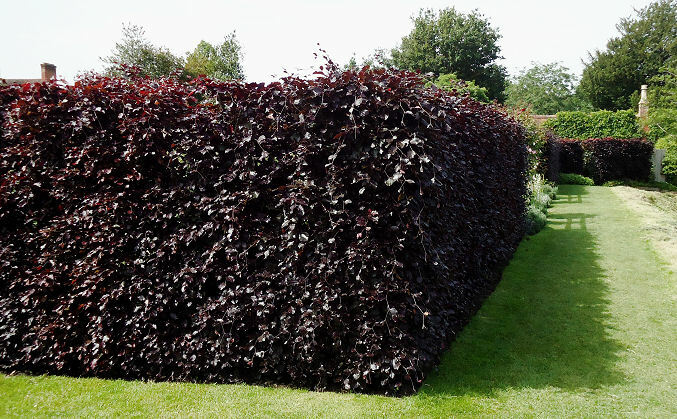 Even when not in flower the greenery makes a statement and they are surrounded by low box hedging at their bases. Standard Wisterias surrounded by box edging!